Plan your weekend with this great list of events happening around town. There is plenty to do for all ages. Join Festival Ballet at The VETS on Friday for an interesting look at two masterworks of ballet in juxtaposition to each other. The two ballets are Études and Coma. This double-bill presentation will be something you&apos;ll surely not want to miss. 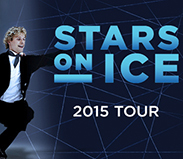 The show starts at 8 p.m.
2015 Stars on Ice "Dancing For Joy Tour"
If you enjoy dancing and ice-skating, you&apos;ll love the 2015 Stars on Ice "Dancing for Joy Tour" at the Dunkin&apos; Donuts Center. This all-star cast of spectacular Olympic skaters will be entertaining for all ages. Headlining the tour are America&apos;s first Olympic Gold Medal ice dancers Meryl Davis & Charlie White and Olympic Gold Medalist Evan Lysacek. The show starts at 7:30 p.m. If pie eating isn&apos;t your thing, then head over to Trinity Repertory Company for their 4th Annual Red, White and Brew festival. A fun-filled night of food, wine and beer tasting mixed with music and dancing. Enjoy food by The Grange, Nick&apos;s on Broadway and north as well as beer and wine by FoolProof Brewing Co., Trinity Brewhouse and much more. Doors open at 7 p.m.
Join the Roger Williams Park Zoo for Science Sundays. Bring the family to discover different science experiments at the zoo from finding out what an owl had for dinner to exploring other slimy secrets! This family fun event is from 1:30 - 3 p.m.